Several weeks back I bought a few e.l.f products from my local Walmart. I was super excited as the selection was huge! e.l.f. is one of those very affordable brands that has a great line up of products and a good handful of their products I’ve tried and loved. A few products like this one and this one are a staple in my skincare and makeup routine. I picked up the Dark Blush Palette , Waterproof Eyeliner Pen in black, Small Stippling Brush and Instant Lift Brow Pencil in neutral brown. Unfortunately this e.l.f shopping trip wasn’t as worthwhile as I had hoped. The title of this posts says it all. Let’s start with the clear winner! This e.l.f stippling brush is the bomb.com! It’s small enough to fit in an average sized makeup bag. It’s a classic black colour and has short bristles. It looks very much like a the MAC 130 short stippling brush. I used the e.l.f stippling brush to blend in my NARS creamy concealer on the under eye area. It’s small enough to use under the eyes and around the corner of the nose. The bristles are very soft against the skin and I picked up product very easily with it. I also used this brush to apply cream blush. Overall I’m really impressed with the brush considering it was only $5! I haven’t washed it yet so I hope after I wash it for the first time it still holds it’s shape and the bristles don’t fall out. I will be going back to buy another small stippling brush to add to my professional kit as well as trying out some other e.l.f. brushes. I just hope they are as good as this one! With the assortment of colours available in the e.l.f Instant Lift Brow pencil and the spooly at the end this product could have been the front-runner for an ABH brow wiz dupe, but unfortunately this product doesn’t work very well. First off the spooly is way to harsh and dense. I used a very light hand and it still felt rough against my skin. I had to apply several strokes of the pencil in the same area to have it show on my skin. The colour didn’t last long( 2 hours) on my brows. I started to see it fade on one of my brows while the other one took a half hour longer to fade. I felt the pencil was too waxy therefore not allowing the colour to properly adhere to the brows and skin. I would probably recommend this to brow pencil to anyone who is just starting to experiment with makeup. If you are a seasoned makeup wearer please skip this product as it will frustrate you during application. The e.l.f. Waterproof Eyeliner Pen looks very sleek and functional. It’s also very deceiving. The tip looks very pointy but it’s actually flimsy and bends if you add a bit of pressure to it.My first experience with the pen wasn’t the greatest.I had to shake it a few times to have the liquid dispense out of the pen and after 10 minutes of sheer frustration I managed to achieve a so-called line but had it rub off on me an hour into my work day! I may have gotten a defective pen ,to be honest ,but I wasn’t going to buy another one. It’s not worth the hassle. I’ll just stick to this e.l.f.liner instead. I know it works and I love it! Out of all the products I purchased, I would have to say this blush palette was my biggest disappointment. I had such high expectations since I read all the great reviews on it. I’ll start off with the PROS of this palette. The cost, obviously, was very affordable at $7. You receive 4 wearable colours and it comes in a nice sleek black palette that can easily be thrown into a travel case and off you go! This palette will take you from season to season. Here are the CONS of this palette. The colours are wearable but not pigmented enough for my taste. It takes a few swipes of the blush to achieve “enough” colour. The description of the palette says it has matte and shimmer shades but I noticed all the shades have somewhat of a shimmer to them. There isn’t true matte shade in the palette. The blush doesn’t last long on the skin. I do not have oily skin and about 3 hours in to my work day I needed a touch up. Overall this isn’t an atrocious, yes I’m being dramatic again, blush palette to have in your makeup bag. However, with the limited space I have and the mass variety of makeup available on the market I have to be picky of what I carry around. e.l.f. used to make an amazing HD cream blush that I have bought in the past and would love to repurchase but I can’t find it at my local store. If you know where I can buy it, please leave me a comment below! DISCLAIMER: I purchased these products with my own money. I was not compensated for my review and my opinions are my own. I am not affiliated with e.l.f cosmetics. This is going to be one of my shortest posts ever! Not because I don’t think the e.l.f. eye refresher deserves my usual in depth blog post but really because this is one of the easiest and relied on products in my daily routine and in a short post I know I can convince you it’s a worthwhile product! 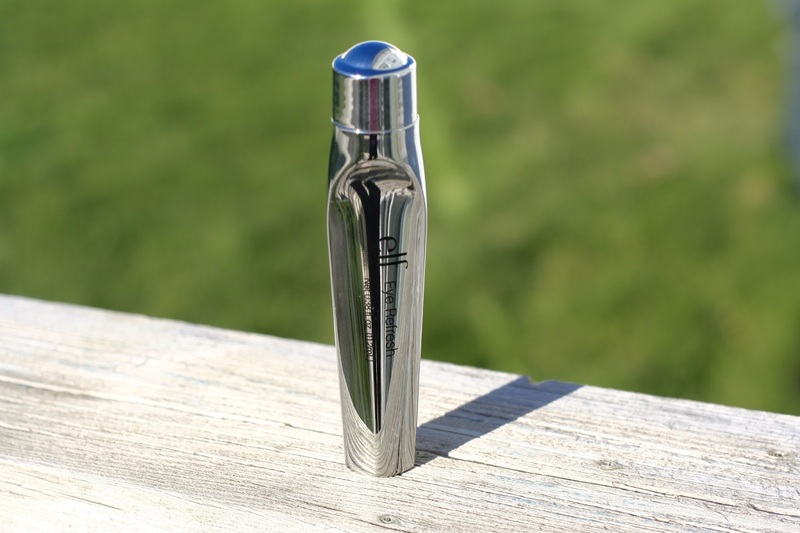 The e.l.f eye refresher is a rollerball tool that can be used day and night. It’s purpose is to refresh, brighten and combat undereye puffiness and discolouration. The refresher contains pomegranate, rosemary,green tea, cucumber and grape to hydrate and nourish the fragile skin. All these ingredients are beneficial in soothing and brightening the skin. In Canada, you can buy the e.l.f products online or at Old Navy. P.S.As per usual, I disclose all information to my readers. I was not paid for this post. I purchased this product with my own money. I am not affiliated with e.l.f cosmetics. Goodbye September! I can’t believe how quickly this month flew by. Who’s ready for the monthly favourites? Writing the monthly favourite post is by far my most favourite post to do. It’s always challenging though because it’s hard for me to not reveal what items made the list till I blog about it. I get so excited about a good find that I have to share it with someone immediately, but I guess that’s why I started this blog ! 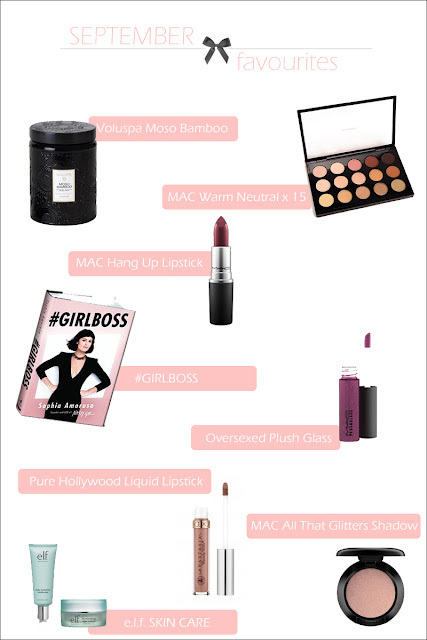 I had a really hard time narrowing it down to 8 products. I don’t know what it is about the Fall but I found myself surrounded by beautiful warm neutral and plum eye pallets, as well as rich burgundy glosses, cozy over sized sweaters and Vince Camuto tall boots …. OK I’ll calm down! As the saying goes, you can’t have it all, so here’s what made the list. Voluspa Japonica Candle Made from 16oz coconut wax with a cotton wix, this candle is now my new favourite. It’s nestled in a custom glass container and at first glance I thought it was a decor piece. It is visually stunning, highly fragrant and can burn up to 100hrs. The elegant container can be reused for flowers or trinkets. I ordered mine off of amazon. MAC Warm Neutral x15 Palette My love affair with MAC continues *sigh*. I debated a bit before buying this palette because I have so many shadows, but this palette is so versatile that I had to purchase it. It contains 15 warm neutral shades and gives you endless combinations, so you can mix to your hearts content. Because it’s neutral shades anyone can pull these colours off. The price point is a bit steep at first, but if you were to buy these shadows separately you would almost pay double the price of the palette.It’s a good deal for a pre-assembled versatile palette! MAC Hang UP Cremsheen Lipstick Hang Up is a deep rich berry colour. I paired it with Vino lip liner, and Oversexed plush glass. It makes the perfect fall lip combination and is beautiful on. #GIRLBOSS Who hasn’t heard of this amazing and driven young lady Sophia Amoruso? She’s the founder and CEO of NASTYGAL, an online clothing shop. She is truly inspiring and the epitome of a #GIRLBOSS! If your looking for some inspiration in your life or just a good read, grab this book and get ready to be empowered! MAC Oversexed PlushGlass As I said previously, I pair this lipgloss with Hang Up lipstick and it’s so beautiful. There is a bit of shimmer to this gloss but not so much that you can’t’ wear it alone, and NO, you won’t look like disco ball! If your familiar with MAC Glass they sometimes can feel very sticky on the lips, but not this one. I wanted to try this product out for a long time. Every time I went to order it, it was sold out. Finally, I got my hands on it. This lipstick is matte, super pigmented, and with only one swipe you have a good amount of colour on your lips. I love how it feels on and I didn’t find it dried them out. It’s unique because it feels like lipstick but in a gloss formula. This is a favourite of Ms.West and she always has to have it on her at all times(according to InSyle Magazine). MAC All That Glitters Shadow I use this shadow quite often and this is my second refill of it. I used it all Summer on clients and it really is my go to shade. It’s beige with a pearl finish. You can use it as a base and combined with plums and berry colours. e.l.f. Skin Care e.l.f. came out with this skin care line last spring. At first I was skeptical when I saw this package on the shelf but of course, being a beauty blogger, it’s my job to pick up these items, try them out and write about them. So I added them to my cart and along I went. I used the illuminating eye cream and serum for 2 weeks straight. I was impressed. I liked the glow the serum gave me and my eye area felt more soothed when I applied the cream. These items for the price was a good purchase. P.s. Did you see , MakeupByMahaMatar.com got a makeover!!!. I’m not done tweaking the site just yet, but it’s definitely getting closer to my vision. Someone pinch me! I love seeing my vision board come to life, it makes all the hard work worth it.